Specializing in commercial real estate for over 40 years, Mr. Thomas Olson is generally recognized as one of the top investment and troubled asset brokers in Southern California and the Western United States. At DWC, Mr. Olson is responsible for the oversight and management of the brokerage services division and for the development and execution of marketing programs for all types of commercial real estate assets. During his distinguished career, he has exclusively represented clients – who he has represented in both judicial and non-judicial contexts – and sold well over $1 Billion in commercial real estate assets and completed over 1,000 leases. His clients include large corporate and governmental agencies, as well as private individuals and trusts. 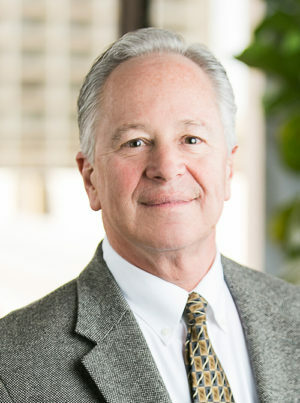 His professional highlights include the exclusive representation and sale while in bankruptcy of the Queens Seaport Development leasehold, which included the Queen Mary Oceanliner and 70 acres of port land and water rights in Long Beach Harbor, as well as the exclusive representation and sale while in bankruptcy of the Super Shops portfolio, a portfolio of 68 freestanding retail stores and industrial properties located in 27 states. He’s earned several recognitions throughout his career including: ranked in the “Top 5 Globally” out of 4,000 Coldwell Banker Commercial agents, the California Real Estate Journal and Real Estate Southern California recognized him for exclusively listing and selling 12 assets with a total consideration of $260M, and Commercial Property News recognized Mr. Olson as one of 15 “hot brokers” across the United States. Mr. Olson earned his Bachelor of Science degree from United States International University. He holds a California Real Estate Broker’s License Number 00381739. Hired by a private investment partnership to market Douglas Wilson Companies’ downtown San Diego headquarters building – an 80,651 SF, nine-story office building and a six-level parking structure with 212 spaces. The property sold for $18,500,000. Hired by the bankruptcy trustee to exclusively market for sale the leasehold interest in the Queen Mary and surrounding property. The assets were owned by the City of Long Beach. Awarded the CRASD 2007 “Out of Market” Transaction of the Year award. The property sold for $43,000,000. Hired by a renowned, family-owned company known nationally for its vine-ripened, pole-grown tomato production. The property spans 460.9 operating agricultural acres in Oceanside, California and was sold to the agriculture division of a large pension fund for $23,870,000. Hired by a prominent San Diego family to market a 178,000 SF former medical campus, sited on approximately 6.35 acres in San Diego, California. The property was sold to a large international language school for $20,000,000. HIred by the debtor-in-possession to conduct a multi-market sale campaign in bankruptcy, the assets included the corporate headquarters facility, 77 freestanding automotive facilities, two strip retail centers and three warehouses all located across 27 states. Hired by a family trust to market a 675,000 SF, two building office complex located in San Francisco, California. The property sold for $85,000,000. Hired by a private investment partnership to market a 384 unit luxury apartment community located in La Mesa, California. The property sold for $85,500,000. Hired by a prominent San Diego family to market 18 industrial buildings, comprising 239,000 SF located in San Diego, California. Awarded the 2005 SDCRA Industrial “Deal of the Year”. The property sold for $42,900,000. Hired by the REO department of a national bank to market a 64 acre site located in Indio, California. The property sold to a top ranked retailer on the Fortune 500 list for development purposes for $4,735,955. Hired by a prominent San Diego family to market two operating mining properties and extensive rolling stock and processing equipment in San Diego, California. Selected by San Diego Business Journal and the San Diego Daily Transcript as a finalist for “Deal of the Year 2012. Hired by a private investment partnership to market a 109,000 SF speciality retail center located in Del Mar, California. The center sold for $32,200,000. Hired by the receiver to sell a 466 guestroom, 345,722 SF hotel located just outside O’Hare International Airport in Rosemont, Illinois. The hotel sold for $5,050,000.